Discussion in 'Sony Programming and Development' started by unclejun, May 10, 2008. And I really mean official, you don't need to throw in your action replay/xploder/whatever! 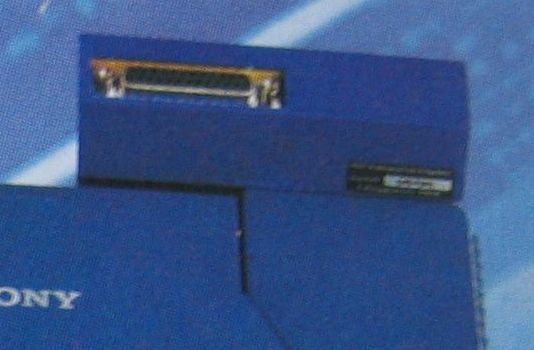 You're talking about the Datel floppy drive that connects to the memory card slot? no! nothing like cheap-looking DATEL crap! 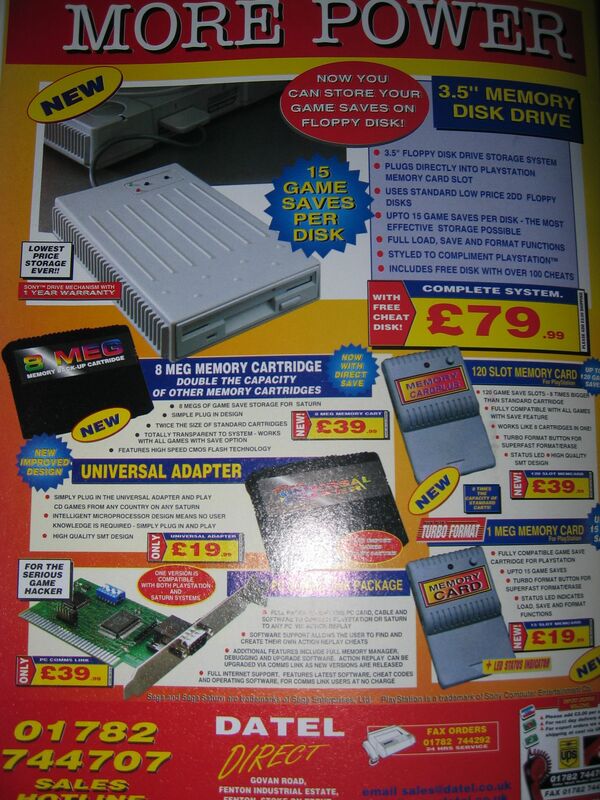 This was along-side other peripherals such as the multitap etc. http://n64.icequake.net/doc/alias85/GamesXfer/Playstation.html mentions "DTL-H1500 Stand-alone box"
while http://www.thefreelibrary.com/METROWERKS+UNVEILS+%22CODEWARRIOR+FOR+PLAYSTATION+RELEASE+5%22.-a053958340 mentions "Support for the DTL-H1500 network attachment box. " It sounds like it could be a device you plug into a DTL-H500. Or it could be another dev kit, which happened to have a network adapter. It's unlikely to be a console peripheral anyway, or they'd be more common. 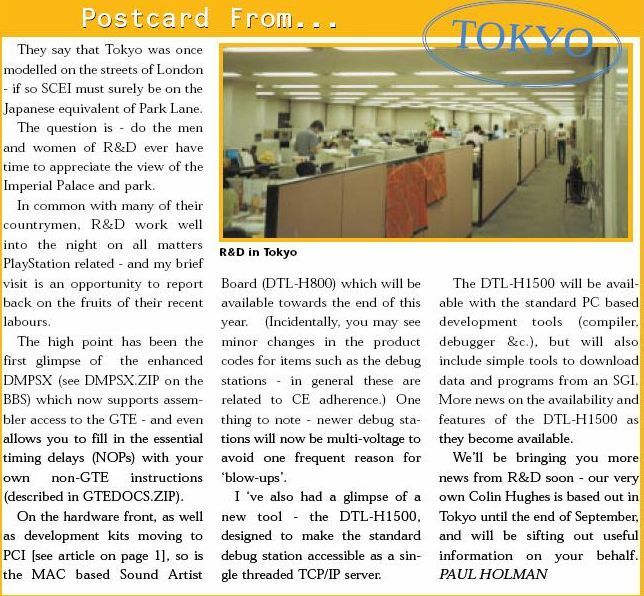 While a DTL-H500 peripheral is going to be as rare as the DTL-H500 itself, which is so rare that it's possible that none exist. If it is a stand alone system, then add it to the list of low volume Sony machines that we will never see. 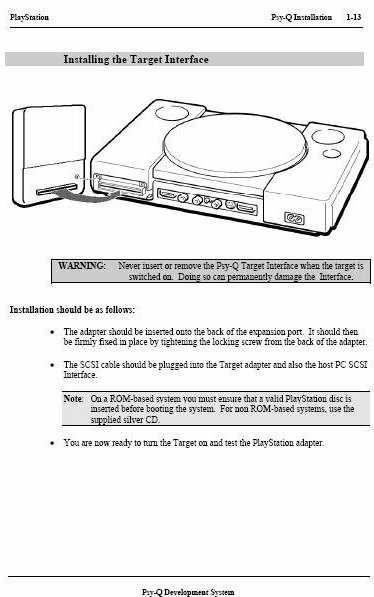 I'm not aware that Sony ever made any official parallel port devices. 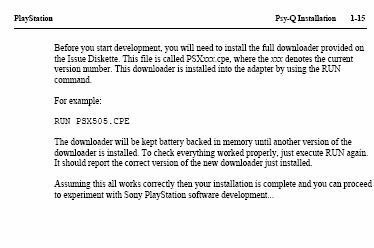 I've been looking out for a Blue Psy-Q cartridge and the closest came in a Psy-Q case and the board was marked with the same company that did the CD emulator boards ( it also appears to have another 2mb of ram that I so far haven't found out how to use.... ). 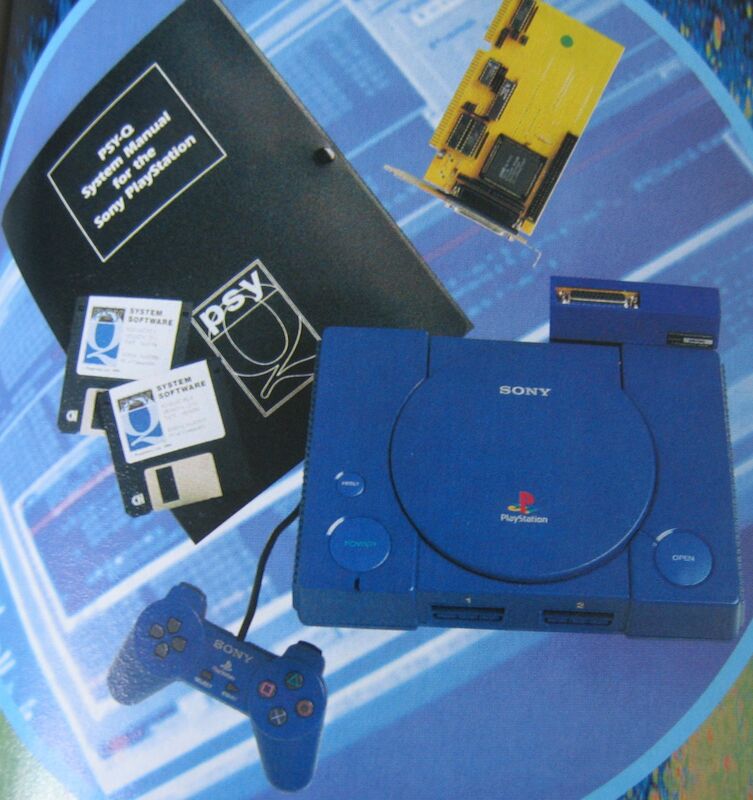 However the Psy-Q logo was covered up and the software doesn't mention SN/Psygnosis/Sony. It appears that when Sony stopped the Blue Psy-Q cartridge from being sold, that someone bought up the cases and boards. Or SN did it on the side to avoid being sued. Sony stopped them selling it because you could develop games on a retail console, which they don't approve of. 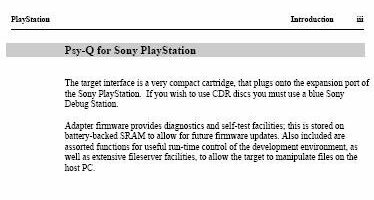 They still don't let you develop on retail consoles, but at least they see the light that you should be able to use a PS3 TEST for debugging. 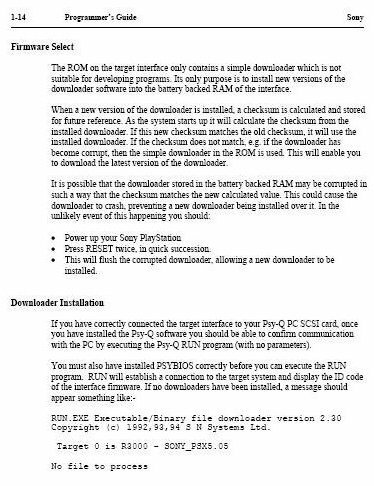 If anyone does have a blue psy-q board then a dump of the rom would be interesting, I can provide the software to do that. Nothing has to be taken apart. with a debug station from their workstations via the network. Later in ‘97 the DTL-H1500 will be introduced, allowing artists to develop directly with a debug station from their workstations via the network. the PSY-Q was advertised in a gamer's magazine? was its sale legal/available to anyone and everyone???! if thats the Floppy drive, then we re talking about different pieces of hardware. The other one I mentioned didnt have any funky condom-stripes on it. 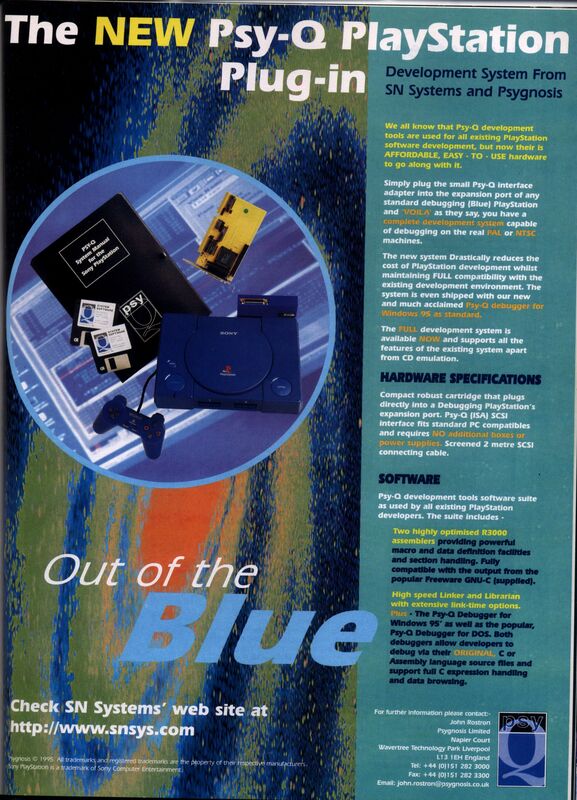 It was much more simple and in the vain of the PSX design. I'd love to see proof that they made it out in the wild. I'm just not convinced. I'll have to check, but I thought that the 25pin connector on the Psy-Q I have is parallel. While that picture indicates it's SCSI. Interesting, I need to disassemble the I/O code on those carts at some point. 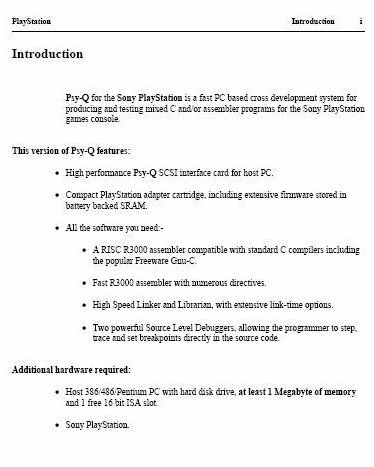 I have the psy-q manual (pdf version) from 1996. Can you upload full manual? The Psy-Q manual or the one you already have? Going off topic, but there was a action replay/gameshark thing that had a Gameboy cart port, so you could play Gameboy games on the PS1! I looked for a picture but couldn't find it. The serial port allowed multiple consoles to be connected for multiplayer or for connecting a console to debugging software. Never heard about using the serial port por multiplayer. Destruction Derby. A fine game published by Psygnosis in 1995. Every multiplayer games without splitscreen option offers serial link connection. I've got oen of those buried in a box around here. I'll have a look and see if I can't find it. Hope you can find it. Never saw those things more than two or three times. There's one on ebay for $15.